Studying animal models and cells taken from patients with Wolfram syndrome, first author Simin Lu, PhD (left), and principal investigator Fumihiko Urano, MD, PhD, led a team that found the FDA-approved muscle relaxant dantrolene may be an effective treatment for the rare but devastating form of diabetes. The drug, dantrolene, prevents the destruction of insulin-producing beta cells both in animal models of Wolfram syndrome and in cell models derived from patients who have the illness. Results are published Nov. 24 in the Proceedings of the National Academy of Sciences (PNAS) Online Early Edition. Patients with Wolfram syndrome typically develop type 1 diabetes as very young children and need insulin injections several times each day. The syndrome also causes hearing loss, vision problems and difficulty with balance. The researchers found that elevated levels of an enzyme called calpain 2 were the main cause of death in brain cells and insulin-producing cells. Dantrolene blocked that enzyme and also prevented brain cell death in animal and cell models of the disorder. 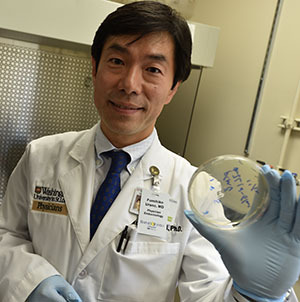 Because the drug is approved by the Food and Drug Administration (FDA), clinical trials in Wolfram patients could get underway relatively quickly, said senior investigator Fumihiko Urano, MD, PhD, the Samuel E. Schechter Professor of Medicine. “We’d like to test the drug first in adult patients with Wolfram syndrome, and if we get positive results, we could extend the trial to children,” he said. Dantrolene often is prescribed to people with cerebral palsy or multiple sclerosis to treat muscle spasticity. If effective in patients with Wolfram syndrome, dantrolene also may be a viable treatment for patients with more common forms of diabetes. 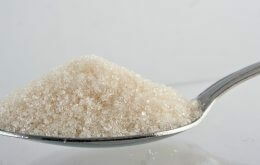 Calpain 2, which is involved in calcium metabolism, is overactive in cell models of those more common forms of diabetes. Wolfram syndrome affects one in 500,000 people worldwide, and many patients die by age 40. Urano and his team of researchers also studied the effects of dantrolene on stem cells from Wolfram syndrome patients and their close relatives, such as parents or siblings. Unlike adult stem cells collected from cord blood or stem cells developed from embryos, the stem cells in these studies were grown from skin cells. The researchers treated the stem cells with growth factors so they would differentiate into specific cell types, such as neurons and insulin-producing cells. 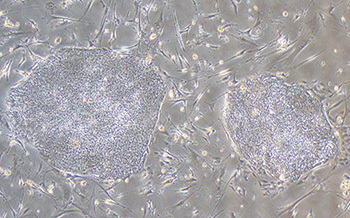 As part of their study of treatment targets for Wolfram syndrome, Urano and his colleagues made induced pluripotent stem cells, like those seen on the left and right above, from the skin cells of patients with Wolfram syndrome. Cells that came from Wolfram patients produced high levels of calpain 2, which induced cell death. But when the researchers treated those cells with the drug, everything changed. Levels of the enzyme dropped, and the cells stopped dying. The researchers are hopeful that dantrolene also may be effective against type 1 and type 2 diabetes. Having found that it also can prevent the death of brain cells and of insulin-secreting beta cells in Wolfram syndrome, Urano next wants to look more closely at how the drug affects other tissues, including the eye. Those studies will begin soon. The research is funded by the National Institute of Diabetes and Digestive and Kidney Diseases (NIDDK) at the National Institutes of Health (NIH), the Juvenile Diabetes Research Foundation, the American Diabetes Association, Team Alejandro, Team Ian, the Ellie White Foundation for Rare Genetic Disorders and the Jack and J.T. Snow Scientific Research Foundation. NIH grant numbers DK067493, P60 DK020579 and UL1 TR000448.